Lace is a decorated fabric that is made either on a background fabric of net or with no background fabric. Today it is used both as an all over fabric and as an appliqued decoration. Way back when lace was a luxury fabric it was always made by hand. Today it is largely machine made, and many of the patterns (usually floral) imitate the hand-made originals. Understanding how much handwork goes into a type of lace and how intricate the design will give you a clue to how expensive it is. 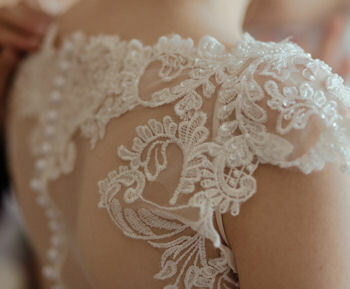 Expect to pay hundreds or even thousands of dollars per metre for the most intricate laces. All over lace. The pattern covers the entire fabric, rather than being isolated on one section of background net. Ajour lace. A very open lace design with the pattern scattered on the ground. Alençon lace. Lace made on a sheer net fabric with a solid design that is outlined by cord. Argentan lace. Somewhat similar to Alençon lace but the designs are usually not outlines with cord. The designs are also often larger and bolder than those of Alençon lace. Belgian lace. Any lace made in Belgium! However, originally it meant a bobbin lace worked on a machine made net. Binche lace. Handmade lace motifs are appliqued onto a machine-made net ground. Bobbin lace. Lace made using a pillow to hold pins around which thread is arranged. Bobbins are used to hold and feed the thread. Not generally used for yardage, but for features such as collars and cuffs. Bourdon lace. Machine made lace, usually in a scroll design with the design outlined with a heavy thread. Breton lace. Lace made on open net, usually embroidered with very heavy coloured yarns. Brussels lace. May be either a bobbin lace or a needlepoint lace. It is usually worked on a machine-made ground and sometimes the designs are appliqued on. Chantilly lace. Lace made on a fine, six-sided mesh background and elaborate patterns, often floral designs. It is popular for lingerie, and is often used for trimming veils. Made by the bobbin method, the designs are outlined by thick cords. Cluny lace. The traditional lace for doilies and place mats it is also used for very structured garments, such as suits. It is heavy, made of thick cotton or man-made fibres using the boobin method. Crocheted lace. Most often used for a Boho style wedding dress. It is made with a single yarn using a crochet hook to form loops which are joined to other loops to form the design. Guipure lace. A type of bobbin lace in which the motifs are made of large corded yarns and are connected with bars or plaits (called brides or bridges) rather than net or mesh. Irish lace. Strictly speaking, a heavy, crocheted lace with a square mesh background, but nowadays any lace made in Ireland, but generally either crocheted lace or embroidered net. Often ornamented with rose or shamrock medallion motifs. Needlepoint lace. Lace made with a sewing or embroidery needle to form buttonhole stitches as the basis of the design. Re-embroidered lace. Lace with the designs outlined with embroidery stitching. Tatting. Generally used for edging veils. A narrow, knotted lace worked with fingers and a shuttle that holds the thread. Valenciennes lace (sometimes called Val lace). A flat bobbin lace worked with one thread forming both the background and the design for the lace. Venise lace (sometimes called Venetian or Venice lace). A needlepoint lace usually having a floral pattern connected by picot edging.